Does Argan oil make your hair grow faster? A reason to look for information might be you experience any issue with your hair. If this is true, you are not alone! Let’s take hair loss as an example. 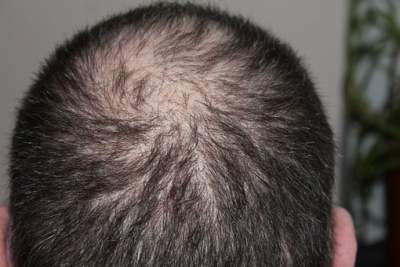 According to the American Hair Loss Association, by the age of 35, two-thirds of American men will experience noticeable hair loss, and by the age of fifty, approximately 85% of men will have thin hair. Unlike many people believe, 40% of American hair loss sufferers are women! And maybe the situation is similar globally. I was curious to learn that people in the US spend more than 3.5 billion dollars a year in an attempt to treat hair loss. Okay, we have the picture clear, right? The reasons behind this picture are many, but one of them is using wrong cosmetic products, full of components, which cause damage to our skin and hair. Why argan oil for your hair? Many people recently realized the opportunities Mother Nature has given us and switched to using natural cosmetics. And here comes the highly-rated argan oil, playing a substantial role in the world of the natural skin and health care. But why is that so? I have extensively covered the topic about unusual chemical properties of argan oil (plus face care tips and advice). Now I will bring the highlights to you. Argan oil is affluent in two fantastic unsaturated fatty acids – linoleic and oleic acid. The first one is omega 6 fatty acid, it is essential for our health, and in case you don’t know, your body can not generate it. You have to find it from external sources (like argan oil). Oleic omega 9 acid reduces bad cholesterol and blood pressure. Vitamin E and caffeic acid are another two solid argan oil components. They both are potent antioxidants, which oppose free radicals in your body. Let’s see how this chemistry reflects your hair care. 4. Adds silky shine and density to hair color. Dyeing may harm your hair. Argan oil strengthens damaged strands and enhances the color. It is at least as good, as jojoba oil. 5. Hydrates scalp. 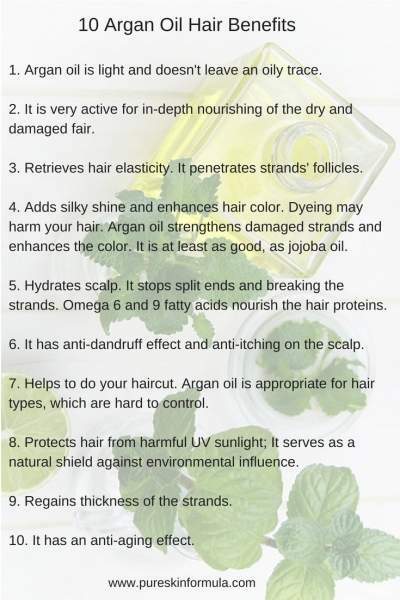 It reduces split ends and breaking the strands. Omega 6 and 9 fatty acids nourish the hair proteins. 7. Helps to do your haircut. Argan oil is appropriate for hair types, which are hard to control. 10. It has an anti-aging effect. How to use argan oil for hair growth with DIY tips and recipes? Follow these simple rules at home, to achieve a better effect. While using argan oil, you could warm it up, before massaging your scalp and hair. Use a wide tooth comb or brush. As a next step, warm up a towel and wrap your head up. The warmth of the cloth will help the hair follicles to absorb the oil to a more significant extent. The longer you can keep it on your hair, the better. If possible to keep it on your head, while you are sleeping, make sure you have covered your head with a towel, to protect the sheets. Wash with shampoo, and when you get dried, you will have your silky hair. For split ends, and hair shine, warm up a few drops argan oil in your hands and apply on the damaged area. If your shampoo does not contain argan oil, you can add a few drops, before usage. You could use argan oil as a balm. 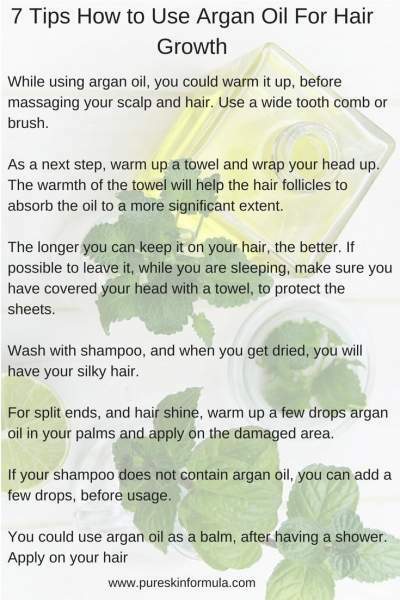 After having a shower, apply it to your hair. What recipes can you apply at home? You will need 1 teaspoon argan oil, 2 teaspoons olive oil, 10 drops lavender oil, 5 drops tea tree oil, 1 egg yolk. Mix all ingredients and massage the hair. Leave for 15 minutes, and wash with shampoo. You will need 1 ripe banana, 1 yolk, 1 teaspoon argan oil, 4 teaspoons olive oil, 4 teaspoons honey. Mix all ingredients, and apply to your hair. Leave for 40 minutes, and wash with shampoo. How to use argan oil for hair growth with natural cosmetics? As a result of its properties, argan oil is a well-deserved and expected ingredient in many natural cosmetic products, related to hair care and growth. Typical categories are hair growth shampoos, hair masks for healthy, or damaged hair. Except for argan oil, a sustainable and powerful hair protection formula would include jojoba oil, castor oil, avocado oil. 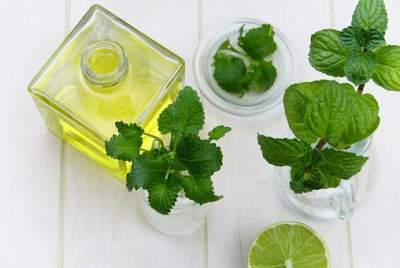 Extracts from burdock, ginger, walnut, nettle are other beautiful solutions for damaged hair. Many sellers pretend to offer natural cosmetic products. But you have to be careful and choose wisely, as some of the cosmetics are not truly natural, and others are of low quality. How to make a good choice, read HERE. I hope this text was useful and you already know the answer to the question does argan oil make your hair grow faster. You also know the benefits of argan oil for hair growth. Of course, argan oil is not magic. Don’t expect that once start using products with argan oil, you will very soon have the “mane” of a rock star. Your hair loss and hair growth depend on many factors – genetics, lifestyle, diet. Cosmetics used is only one of them. All I want to say is if you use the right natural components, all other things being equal; your hair will perform better! Genetics you cannot change, making a shift in lifestyle takes a long time and effort. An easy way to inspire a positive switch is through a healthy diet, but the quickest path to hair growth is to start using appropriate cosmetics! I would love to hear from you! Do you (plan to) use argan oil for your hair? Leave me a message, and I will answer you! I had no idea argan oil was good for hair growth. Im going to have to get some ASAP. Thanks!! I am one of the avid fans of using argan oil and I have been using Oragnic Argan oil shampoo and it is really fantastic. But I am really curious about your hair mask recipes, I will definitely try it tonight. Thank you so much.. Thank you for stopping by! I am glad you liked the mask recipes! I can confirm organ oil is an instrumental component of natural shampoo. I just read your previous post about argan oil benefits for the face. Interesting to learn that argan oil also can make the hair grow faster and that it helps to regain the thickness of the strands. This really sounds like magic! I’m nevertheless aware of that the hair growth depends on other factors too as you mentioned. Is it also possible to use the argan oil in the cooking and salad dressing? With all its healthy substances like omega-9 fatty acids and vitamin E, it seems to be very nutritious. Thank you for reading my latest post for hair benefits of argan oil! To your question: Yes, you can use argan oil for culinary purposes. As far as I know, the kernels are baked first and then ground, to get thick, narrow substance, out of which you squeeze and derive argan oil. Argan oil for cosmetic purposes is processed from raw nuts through a cold press.